Solar Power PV systems that can be roof-mounted or freestanding to produce electricity that can be fed back into the Grid or used by the householder. We'd suggest only use systems that can be warrantied for twenty years or more. Caisse Energy work to the Government's MCS standards in sales, installation and after-sales support. Realistic domestic systems cost from £1,000 to £10,000. The bigger systems give better returns because of economies of scale. 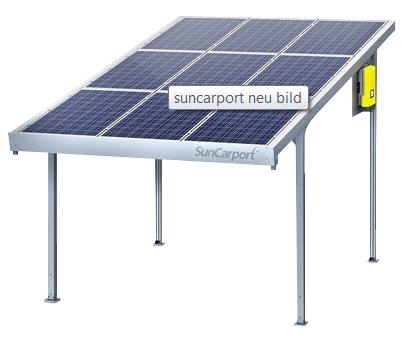 We've also installed them as car ports using the SolarWorld system - see the picture on the bottom left. See our FAQs about Heat Pumps here. How well do solar panels really work here in England? This small site in Staffordshire produced 1.7MWs last year. This was about 12% more than predicted. You can see that most of the power is produced in March to October. It varies slightly from year to year but follows the same pattern. The power produced varies dramatically from day to day depending on the weather. Don't let a saleman tell you they work as well on dull days as bright - they don't.